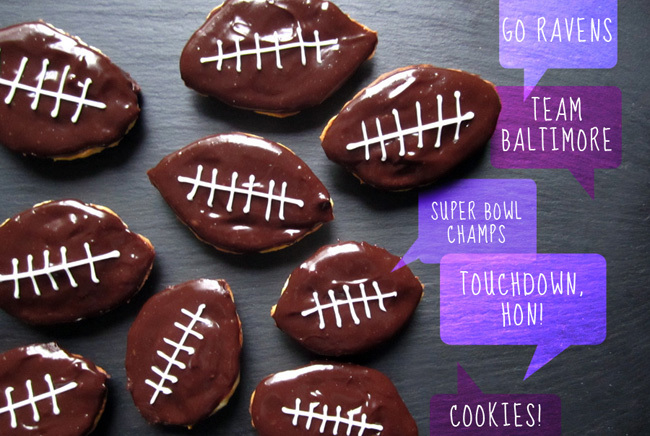 Pixel Whisk: Super Bowl Football Cookies! Seeing as there's a big football game on this weekend, I suppose it's time for me to take a side. Technically, I'm not really a fan of either team. (You were almost there, Redskins!) I am, however, a fan of Baltimore, so that means I'll be routing for the Ravens this Sunday! When it comes to Super Bowl sweets, there is no better Baltimore treat than the Berger cookie. If you aren't familiar with this rich chocolate topped cookie–and you likely wouldn't be unless you grew up or live in the Baltimore/Washington DC area–I loosely compare it to a Black and White cookie. But it really isn't the same. 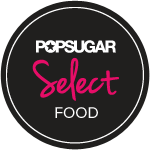 Berger cookies are composed of a fluffy cake like cookie and a double dose of chocolate fudge on top. 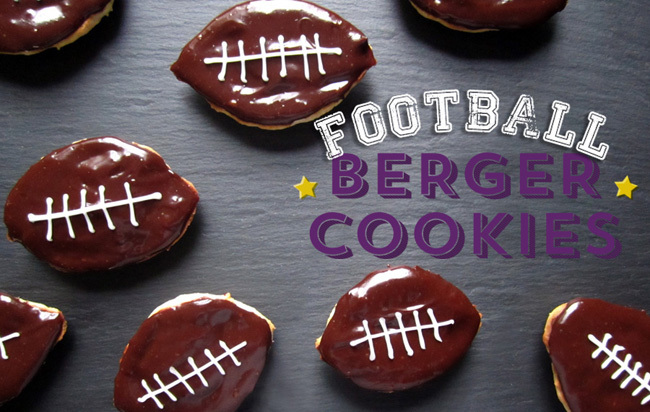 Black and White cookies tend to be more refined than Berger cookies, plus there's no white frosting....except when it comes to these football cookies, of course! 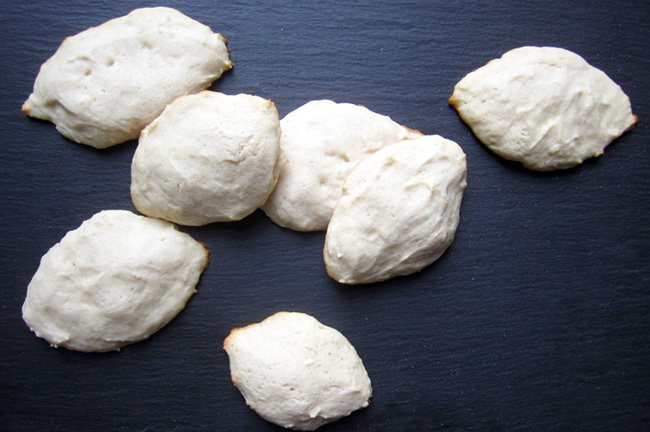 There's no better way to route for Baltimore than baking these classic Berger cookies. 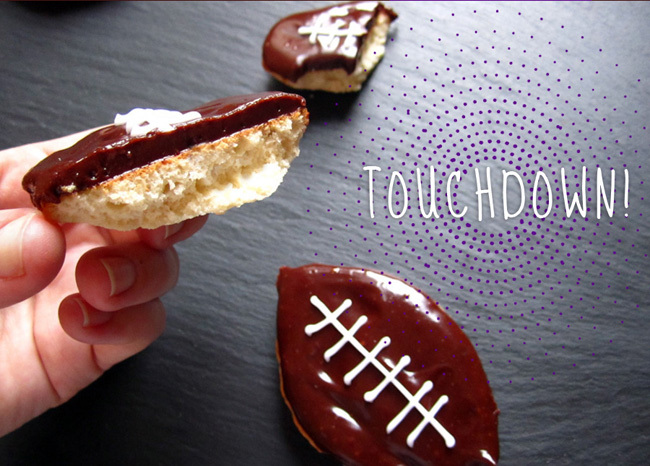 It just takes a simple tweak to form them into football shapes and a "laces" topping with white frosting. The bakery that produces Berger cookies doesn't post the actual recipe anywhere, so I used the King Arthur Flour Berger Cookie recipe (version 2). 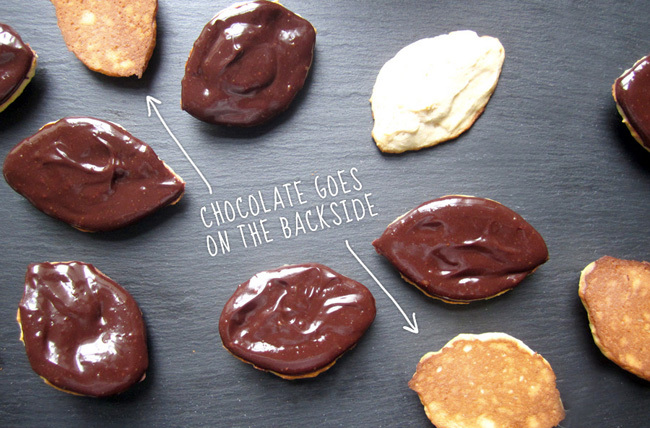 These cookies are worth baking even if you happen to be routing for the 49ers this weekend! Baltimoreans–and this includes you, family!– make these cookies and let me know if they taste as good as the classic Berger Cookie. Who knows...making them could give the Ravens some luck this weekend. 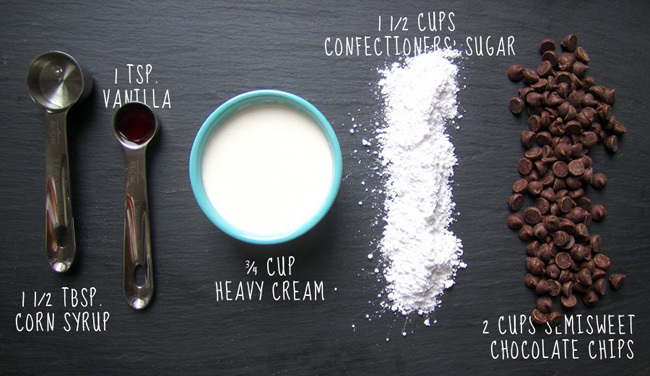 To make the icing: Place the chocolate chips, corn syrup, vanilla, and cream into a large microwave-safe bowl, or into a large saucepan. Heat the mixture till it’s very hot; the cream will start to form bubbles. Remove from the heat, and stir until smooth. Beat in the confectioners' sugar. Let cool to warm room temperature while you make the cookies. To make the cookies: Preheat the oven to 400°F. Lightly grease (or line with parchment) two baking sheets. 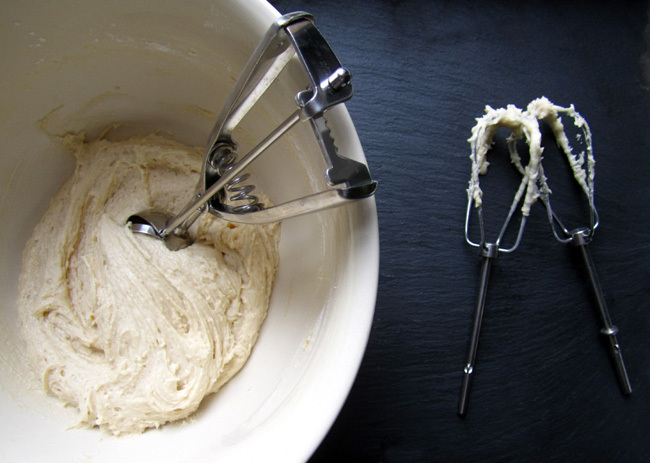 In a large mixing bowl, cream together the butter, salt, vanilla, and baking powder. Beat in the sugar, then the egg. Add the flour to the wet ingredients alternately with the milk, beginning and ending with the flour. Do this gently; there’s no need to beat the batter. 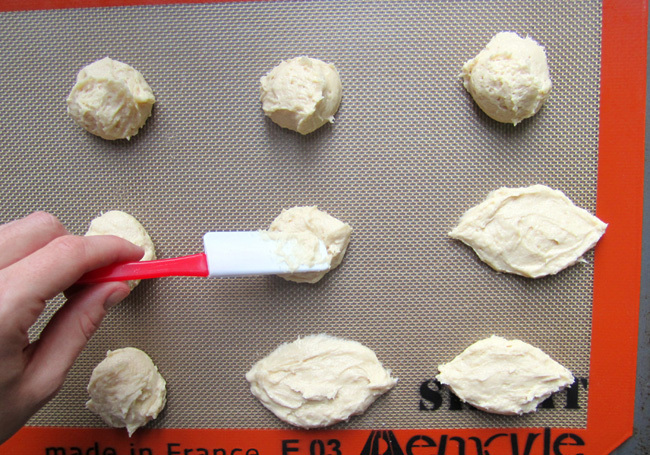 Using a teaspoon cookie scoop, drop the dough onto the prepared cookie sheets. Use a small spatula or a knife to smooth each mound of dough to a football shape about 2" across, Leave 2"; to 2 1⁄2" between each cookie, for expansion. Bake the cookies for about 10 minutes, or until they’re a mottled brown on the bottom (carefully tilt one up to look), but not colored on top. You may see the barest hint of browning around the edges, but these cookies are supposed to be soft and cake-like, so don’t over-bake them. Cool the cookies on the pan for 5 minutes, then transfer them to a rack to cool completely. Dip the flat bottom of each cookie into the icing; swirl the cookie around to really give it a good coating. Set cookies back on the baking sheet, or on a rack. Spread remaining icing evenly atop the cookies. It’ll feel like you’re piling on a lot of icing; that’s precisely the point! Allow to set, then store airtight in a single layer. The frosting for the "laces" couldn't be easier. 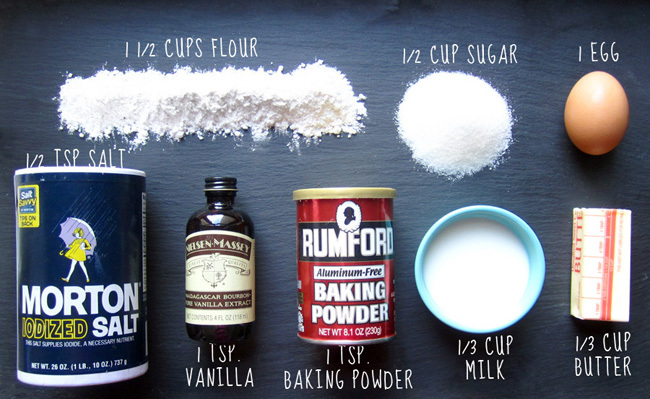 Just mix a cup of confectioners' sugar with a Tablespoon of water. Add more water if the frosting is too thick. 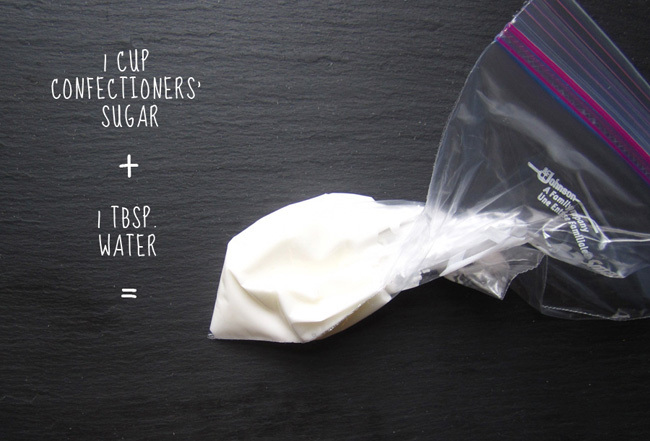 Spoon into a ziplock bag, snip a very small hole in the corner and pipe your "laces!"